I know I am in for a different kind of meal when I toss a handful of crickets into my mouth. STARTERS Chips, guac, and crickets were our chef's table appetizers at The Bear and Star restaurant in Los Olivos. 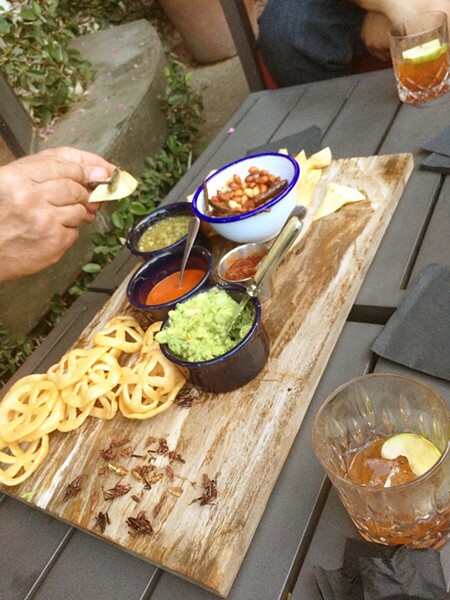 The crickets, fried up with a little lime and salt, are served with a platter of chicharrones, tortilla chips, salsa, and fresh guacamole as appetizers of sorts. We eat them on the porch of The Bear and Star restaurant in Los Olivos. The sun is just beginning to set as my fiancée and I wash our crickets down with mezcal cocktails and chat with other diners about the pleasant weather. After a scorching summer, fall is finally coming, we all agree. We are here to attend one of the Bear and Star's famous chef's table dinners, where chefs from other restaurants are invited to collaborate on one-of-a-kind multicourse menus. This particular evening, the menu featured Oaxacan-inspired cuisine courtesy of Cultura, a restaurant in Carmel. After the small bites, we are ushered into the chef's table dining room, a softly lit space with long communal tables. To my right is a massive bookshelf loaded with cookbooks of all shapes and sizes. To my left, a large window looks into the restaurant's bustling kitchen. We make polite conversation until the food starts coming out. The food is, of course, delicious. There's the corn huarache, served with heirloom tomatoes and a goat cheese sauce—it's crunch and warmth cut by the tang of tomatoes and cheese. A few more courses in, the chef serves up my favorite dish of the night: melt-in-your-mouth pork cheeks with a dark and flavorful mole-inspired sauce that's so good our usually talkative table goes dead quiet as we dig in. To boot, a couple of dishes are paired with different mezcals as opposed to the usual wine. The smoky burn of the drink is a pitch-perfect complement to the spicy, sweet, and savory flavors of the food. 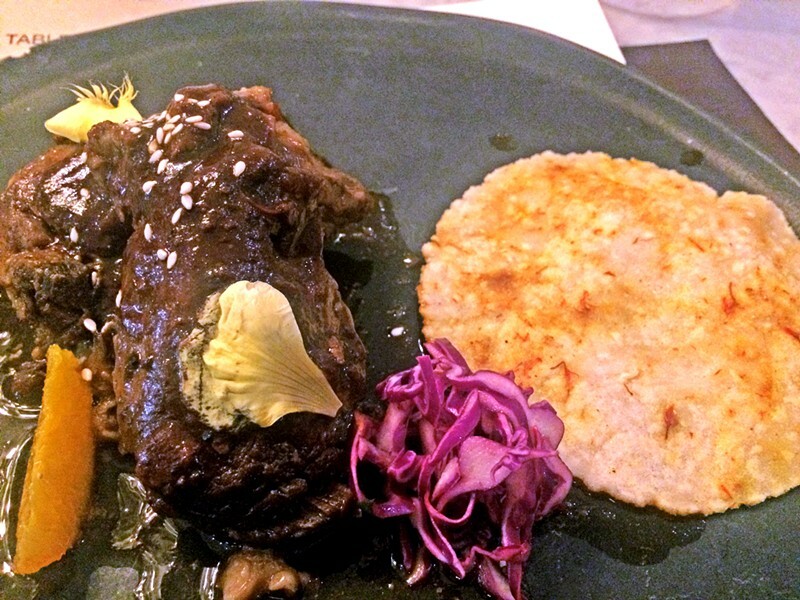 A TASTE OF OAXACA Pork cheek in mole sauce. What more could you ask for in a tasty Oaxacan meal? This is the second chef's table dinner I've been to at The Bear and Star. Once again, I am struck by what an interesting and intimate experience it is. Here in California, we like to talk a lot about where our food comes from in terms of the ingredients on our plate, but how often do we think about who it comes from? The chef's table not only gives us a chance to chow down on some amazing food, but it gives the chef a chance to tell you a story about who they are through their food. Chefs are artists, and like most artists, they're incredibly passionate about what they do. To get a window into their minds and hearts is a privilege, and certainly worth doing if you have the chance. Staff Writer Chris McGuinness is always down for a good meal. He can be reached at cmcguinness@newtimesslo.com.